The majestic splendour of the sights that greet travellers along the Everest Base Camp trekking route is one of the most memorable aspects of the journey, and there are few places on Earth where the glory and might of the natural world can be witnessed to such a degree. Learning something about the science behind the breathtaking views surrounding the mighty Mount Everest (8,850 metres) can only enhance the viewer’s appreciation, so if you are contemplating making the trek, why not brush up on some Himalayan geography before going? Here is an introduction to some of the most important geographical features of the region. It may not be one of the world’s premier wildlife watching destinations, as the high altitude and extreme climate make survival a challenge – but those who go Everest Base Camp trekking may nevertheless be surprised by the striking flora and fauna that greet them as they go. The start of the journey takes trekkers through forests filled with colourful plants, birds and butterflies, as well as mammals and reptiles that the observant trekker may be able to catch sight of. Even in the higher, more remote regions there are impressive creatures to be seen, including soaring birds of prey, and the lively Himalayan tahr – and, of course, although they are not wild, the famous yaks. As well as the highest mountain in the world, the Everest region of the Himalayas is home to the tallest glacier: the Khumbu Glacier, which reaches heights of 7,600 metres. 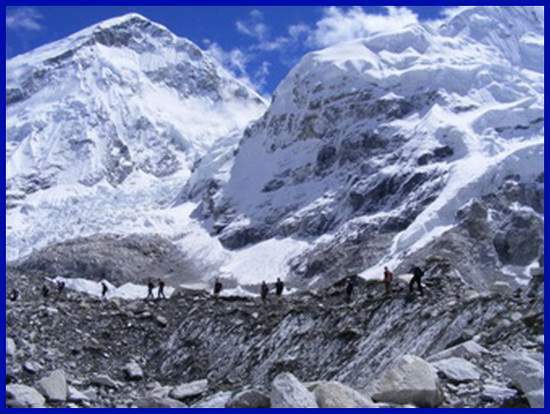 The glacier is one of the most important features of the Everest Base Camp trekking route, as Base Camp itself is built onto its surface. Formed by the accumulation of snow over the centuries, the Khumbu Glacier is a key contributor to both the beauty and the environment of the region, and includes one of the most memorable sights of the trek: the Khumbu Icefall, a part of the glacier that flows at a speedier pace than other sections, creating a dramatic cascade full of treacherous crevasses that those attempting the mountain’s summit must navigate. One of the most interesting aspects of Mount Everest is its geology, and learning about its formation can instil a sense of awe in those who see it while Everest Base Camp trekking. Its origins, along with the rest of the mountain range, can be traced back to the monumental collision that occurred between the Eurasian and Indian tectonic plates, which caused layers of rock to be thrust up against each other – thus leading to Everest’s unique composition, consisting of three different layers, the topmost of which contains fossils of prehistoric marine creatures – a testament to how ancient and wondrous the natural world is.